Visit the city of Agra the home to one of the seven wonders of the world and take a pause in the city of the Mughals. Get an opportunity to visit Taj Mahal, Agra Fort, Baby Taj, and Mehtab Garden in a day. Admire a sunset view of Taj Mahal from Mehtab Bagh. Your tour starts with a pickup from your hotel or desired location in Agra and post which you will head to the spectacular Taj Mahal. Enter in style with a royal horse cart ride. Admire its majestic architecture as your local guide talks about its history. Later, you will visit the nearby Agra Fort, which features impressive architecture and beautiful pavilions. Listen as your guide explains details on this red fort's beautiful palaces as well as its origins and history. After the tour, you may take a 1.5-hour break for lunch at a multi-cuisine restaurant. Post lunch you will proceed to visit the tomb of Itmad Ud Daulah on the bank Yamuna River. Also considered a miniature Taj Mahal, this is an architectural marvel. It was built by Noorjahan in the memory of her father. Your last stop is a romantic sunset view of the Taj Mahal at Mehtab Bagh. Located across the Yamuna River, it's a perfect place to view the Taj Mahal without the crowds. Your tour ends with a transfer back to your hotel/desired drop location in the Agra city limits. Will this be a guided tour? Is airport pick-up & drop include? What car option will be provided for the tour? Pick-up is available from Delhi only or from whole of NCR region? Will the guide be travelling with me from Delhi? The guide will meet the guest in Agra and arrange for the tickets. From Delhi, a driver will pick you and drop you back at the end of the tour. What language will the guided tour be in? English speaking guide is included in the price of the complete tour. If preferred, members can opt for - Spanish, Italian, French, Japanese and Russian speaking guide for the tour at an additional cost of Rs. 2000 per hour. Guest can choose this option while booking. English speaking guide is included in the price of the complete tour. If preferred, members can opt for - Spanish, Italian, French, Japanese and Russian speaking guide for the tour at an additional cost of Rs. 2000 per hour. Guest can choose this option while booking. English speaking guide is included in the price of the complete tour. If preferred, members can opt for - Spanish, Italian, French, Japanese and Russian speaking guide for the tour at an additional cost of Rs. 1500 per Day. 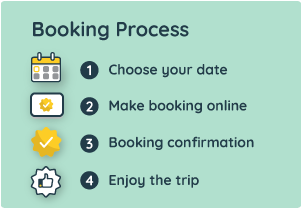 Guest can choose this option while booking. At the time of boarding, will guest be provided with bottled water and reading material? Are toll and parking charges part of the cost provided?